Mount Alban was the capital of the powerful Zapotec civilization from around 500 BC to 800 AD. Monte Alban majestically sits on an artificially flattened mountain top overlooking the valleys of Oaxaca in central Mexico. The center of Monte Alban is a vast plaza ringed with temples, royal tombs and other ancient structures. 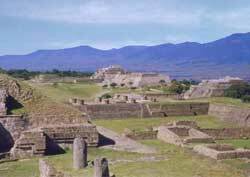 The Monte Alban glory days covered two centuries, 600 to 800 AD. It was quite powerful and had a metropolitan population of at least 25,000. The Zapotec civilization then started a rapid decline and eventually Monte Alban was abandoned. The Mextics took over and used the summit primarily as a burial ground. The best panoramic photo vantage point for the ruins is on the raised area named the Southern Platform.